Celebrate the holidays with Amelie! Decorate and upgrade three Christmas cafés, prepare a variety of yuletide favorites for your guests, and earn enough money to fill Santa's sleigh in 50 fast-paced levels. 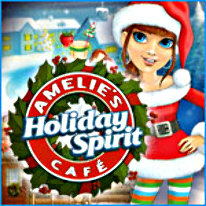 Amelie's Cafe: Holiday Spirit also features a match-3 mini-game that allows you to earn bonuses as you play and an all-new special mode for skilled players. With simple but challenging gameplay, delightful holiday graphics and three time management modes to master, Amelie's Cafe: Holiday Spirit is your ticket to Christmas cheer!